Many of the readers requested for this recipe. So finally here it is. Though I love paneer, I use it very rarely in my cooking. Recently I bought it to make ‘butter paneer masala’ for a small get together at home. The next day, I made this mater paneer – green peas with paneer, with naan. I have noticed that, frying paneer for few minutes before adding it to any gravy, makes it very tasty. So that is what I followed for this recipe too. Another thing I am following these days is, making fresh spice powders. That makes the dish very fragrant. 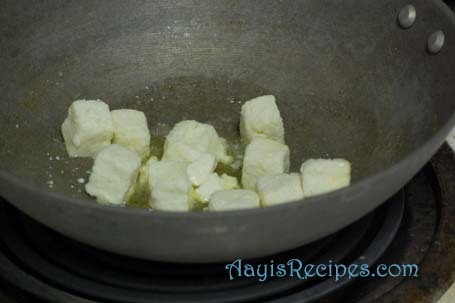 Heat ghee/butter/oil and shallow fry paneer cubes till they turn golden brown. Take them on a clean paper towel. Now add bay leaf, cumin seeds to the remaining oil. When cumin seeds start popping, add ginger-garlic paste and fry for few minutes. Now add peas and fry for few minutes. Add the tomato and onion(or cashew) puree, spice powder, salt and let it cook till the peas are done. Now add paneer and cook for 2-3 mins (do not mix a lot, the paneer gets crumbled). Looks so yummy delicious. I am bookmarking this. Thanks for this recipe.. I just finished peeling a kilo or so of pea pods 🙂 One question… Tomato based gravies always turn out sour for me… What to do? Shilpa: Do not use very sour tomatoes. Use the ones which are very red and less sour. Shilpa, lovely color n texture of this. ( Sanjeev Kapoor tip..which I follow when I use frozen paneer, lightly fry in tsp oil, and keep in warm salted water until use..maybe 15-20 mins..try kari kedanai fresh ani soft zatta..) Tks for sharing your methods and agree that fresh spices surely take the dish to higher level! The photos look great. Thanks for the recipe. I am definitely going to try it this week. I”m in a new job and it’s taking much of the energy I used to have to gaze at recipes and cook on weeknights. Paneer is always my favorite — I need to make this dish your way. The bay leaf must add a special taste esp. with bigger peas. Also, I love your kadai… do you mind if I ask whether you got that here in the states? Shilpa: So nice to see you here Linda. I got the kadai from India. i do matar paneer the same way.i tried your prawn rice it was so yummy and i could do in flat 15 mins. Did you prepare Naan at home? If so, can you post the recipe for making Naan at home? Can I get a picture from your blog? Of course, i will place a link to source. Shilpa: I would like to know which picture you need. I tried your recipe and it came out well. One cool tip to keep paneer soft after frying and prevent it from getting dehydrated and rubbery is to quickly soak it in a bowl of warm water after frying. Thanks for the wonderful recipe shilpa.. tried it and it was a super hit at home..
Paneer is my favorite. I often make a dish similar to this. Looks yumm. I am just go through your site and it’t nice.This receipe is nice, simple and easy. I will try to use fresh ginger and garlic paste as I always use readymade. 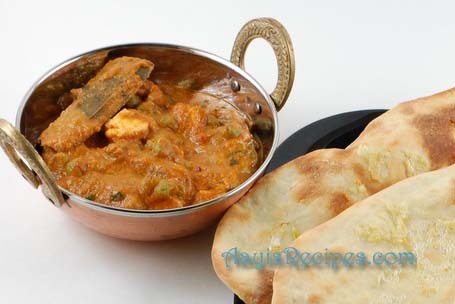 hi shilpa this matar panner is mouth watering,should definetly try this,i love panner dishes and always do dishes like karahi panner,garlic panner,mushroom with panner curry and especially panner pasanda my all time favourites.but never did this should tyr this awesome recipe. This came out very tasty….but i did not get the reddish colour as shown in your picture…..any tips for that? i tried this it turned out great as usual with your recipes!I altered a bit i.e onions substituted with almond/ cashew paste and minus garlic ..also added a pinch sugar! Gravy was amazing! Thank u for a tasty recipe! Hi Shilpa, are the spices to be roasted before making the powder? What do you use to make the powder? I did not roast them. I use mortar and pestle. 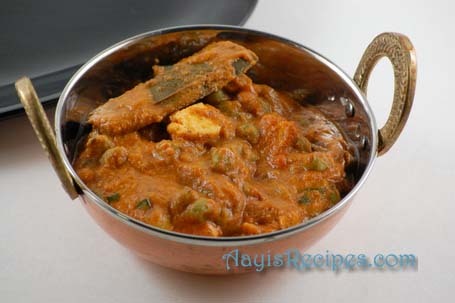 I liked your recipy of Matar Paneer.My husband is going to kiss me for this recipy. Thanks for the recipe! Can you please tell me what goes in your spice powder? Is it all the ingredients up until cumin seeds? Tried this recipe. Turned out great. Thanks for sharing.